Novels have an implied contract with readers, in that their covers, titles, and descriptive blurbs create an expectation of the type of story that lies within. For this book, the title suggests a police procedural; the author’s name and reputation suggest something more offbeat and contemplative; the cover suggests something half and half; and the back cover blurb could go either way. McCall Smith has written dozens of humanistic novels about people and their places with poignancy and humor. So if you expect that type of book, you’ll be delighted by this one. If you don’t expect it, you might be disappointed. Yes, Detective Varg investigates crimes. But he does so rather like Mma Ramotswe in McCall Smith’s famous No. 1 Ladies’ Detective Agency series. The differences are Varg is a policeman in Sweden, and Mma Ramotswe is a private investigator in Botswana. But the flavor is the same in both. The sensitive situations Detective Varg must investigate do not involve murder or cruelty. They are more about the silly or stupid situations people get into that are minor on the criminal scale but majorly important in the individuals’ lives. In this first book of a new series, Varg and his colleagues in the Department of Sensitive Crimes seek out the perpetrator who stabbed a man in the back of the knee in a marketplace; hunt down a missing imaginary boyfriend, then his missing real girlfriends; and uncover the scheme behind a health spa owned by the chief’s cousin that’s being driven out of business by mysterious noises. Each of these involves human passion or insecurity that escalates out of control but is resolved by gentle probes and conversations. For readers expecting a police procedural, the investigations are so shallow as to seem implausible. For readers expecting a compassionate and interesting backstory, however, the author delivers. The narrative flow has the same dual quality. Readers expecting the faster pace and action of a police procedural might be bored by the philosophical sidetracks the characters embark upon in almost every scene. But readers seeking those philosophical moments will be gratified and intrigued, because they take us to thought-provoking truths about ourselves and others. This book is a case in point illustrating the difficulties in marketing a story to the correct audience. Its international, humanistic, literary appeal leaves it wide open to multiple categories and interpretations; but its positioning on a major purchase site like Amazon reveals the weirdness that can result. Who knows where bookstores will shelve it. Cozy Animal Mysteries? Well, there is a dog in the book—Detective Varg’s dog, Marten, who is suffering from depression—so perhaps that’s why it ended up in this category. But Marten has nothing to do with the plot, so one can only wonder how he helps direct potential readers to the novel. Then again: Marten contributes to the deep characterization that McCall Smith excels at, so perhaps the book’s tag isn’t that far off the mark. categorization must have something to do with humor. McCall Smith’s books are always mildly funny without being thigh-slappers (although this one claims to be “a tour de farce” on the jacket). The closest categorization of the three seems to be International Mystery & Crime. 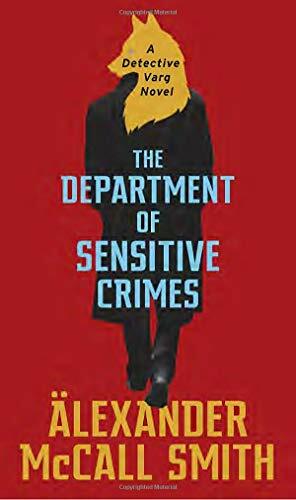 All that said, if you like learning about what makes people tick, and you appreciate the underlying absurdity and pathos of life, then Department of Sensitive Crimes will tickle your funny bone and resonate in your heart. That will draw McCall Smith’s millions of fans to this new series. Will it attract anyone else?